What if there was something you could easily use to stay organized, save time, and appear more professional in your art career? Well, look no further than Portfolio Pages. These pages give artists the ability to share their art in a clean and polished way and include every important detail from title, size, artist name, description, and price to inventory number, creation date, and your contact information. Artwork Archive let’s you generate these detailed pages of your pieces so you can easily share your work with interested clients. 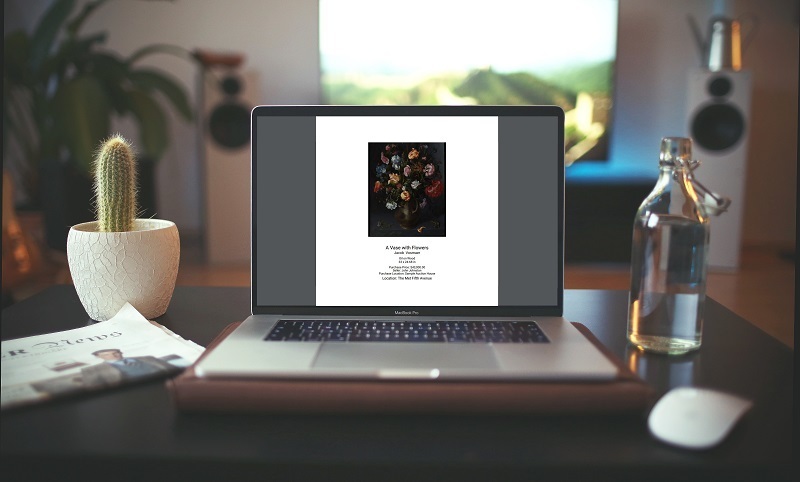 Here are five ways to use Portfolio Pages to wow potential buyers and gallerists and boost your art sales. Having a portfolio displaying your pieces and their details is a smart way to showcase your work to fans visiting your studio. Your potential buyers will want to see what is available, but impressing them can be hard when trying to dig through big and bulky pieces or realizing a piece you want to show them is actually on display in a gallery. Instead of racking your brain to remember each piece’s size and price, you can keep a simple portfolio filled with all the information potential buyers will need to make a purchase. This allows you to stay organized, so you can save time and impress potential buyers right in the studio. An example of a portfolio page made on Artwork Archive. A neat and professional Portfolio Page is the perfect way to grab an interested client’s attention. Did a collector recently purchase your art? Sending a polished Portfolio Page about a similar piece could help you land another sale. Another advantage to using Portfolio Pages? 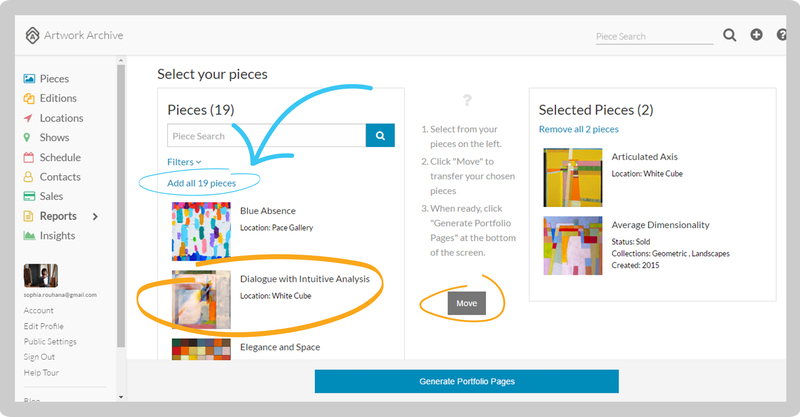 You are making it as easy as possible for galleries to work with you. This organized collection provides all of the information they need, from price and size to creation date and your contact info, so galleries don’t have to worry about tracking down any more details about your art. You can even include a description about the piece where you can tell the story behind your work, as well as provide award, show, and publication history. Galleries will appreciate you providing information that will help them sell your art. Speaking of galleries, some may even request a portfolio book of your artwork. Impress them with your timeliness and professionalism by easily generating Portfolio Pages in bulk on Artwork Archive instead of taking days trying to design every page yourself on Microsoft Word and adding in details one by one. Talk about a time saver! That’s a lot of time you can now spend on creating art. 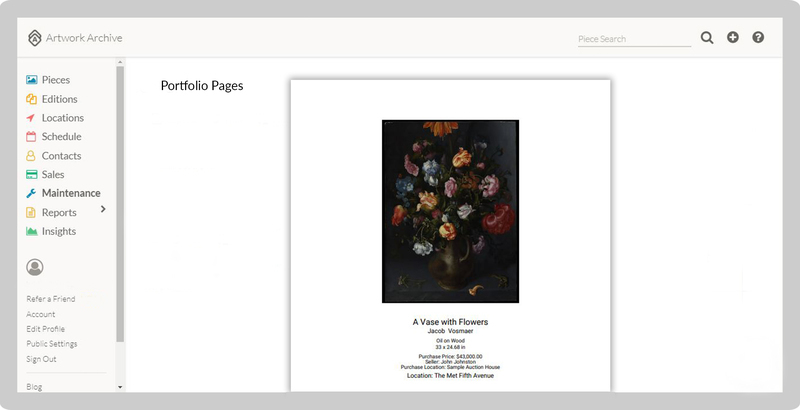 You can choose the information you’d like on your Portfolio Page within Artwork Archive. Finally, another great use of Portfolio Pages is showing off your latest artwork to fans and potential buyers in your artist newsletter. Adding in the PDF page that already includes the piece’s image, details, and story is a fast and easy way to promote your work online so you can sell more art. Artists can save endless amounts of time and seem extra professional simply by using Portfolio Pages in their art business. Presenting the details about your art in an organized way will help spark the interest of potential buyers and gallerists, as well as provide a quick and painless way to share and promote your artwork. Then you can spend more time making sales and creating more art. Want more? Learn about four other reports that impress buyers and galleries here.